There's a big smartphone operating system upgrade coming this autumn. We're not talking about iOS 5 – although fans of this will be just as desperate to get their hands on Redmond's latest offering. It's the best part of a year since Microsoft pressed CTRL, ALT + DEL on its Windows Mobile operating system and unveiled a new smartphone system called Windows Phone 7. Up against Apple's iPhone, the young pretender Windows Phone 7 is as removed from the clunkiness of its forefather as it probably could be, heralding a new direction for the dominant force in desktop computing. But it came with some glaring omissions, and now is the time for 'Mango', the first major update to fix all that. 500 APIs have now been opened for developers. Journalists have been given a 60-plus page guide to the latest additions so that nothing is missed. The question is – is it enough? 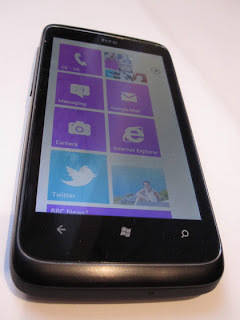 Note that we're reviewing the upgrade to Windows Phone 7 here rather than a specific handset. This article concentrates on some of the new features and is not a detailed review of the entire operating system. 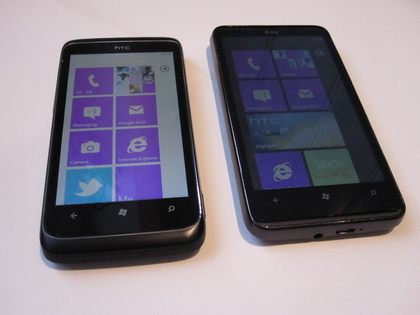 For comparison, we're looking at an HTC 7 Trophy running Mango (pictured left) and an HTC HD7 running the original Windows Phone 7 operating system. Please bear in mind that this is a preview build of Mango and, therefore, is missing some features which will be released when it is officially rolled out in autumn 2011. 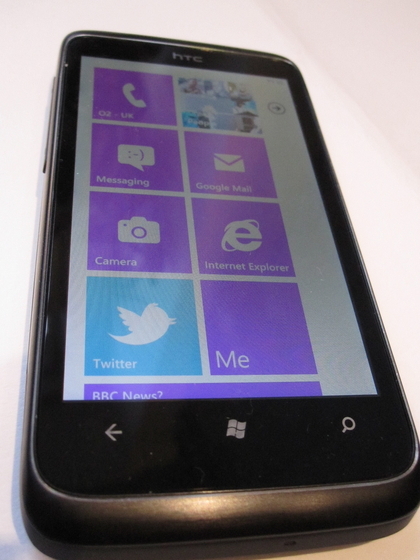 We have to say from the off: we're big fans of Windows Phone 7. From the first time we turned it on, it felt fresh and new, and that hasn't changed in Mango. 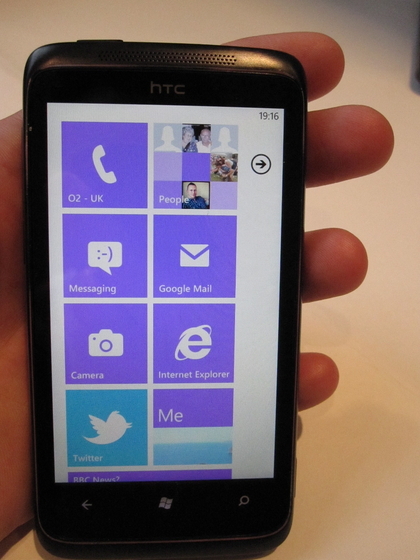 It all looks the same, and all centres around the live tiles system. You can't miss them – they're huge things on the home screen that change before your eyes. They're customisable – you can change their colour, their location, their nature and because they're 'live', they update before your eyes with pictures and information. It's more elegant than the older pop-ups system, but also more rigid. Manufacturers can't skin Windows Phone 7 in the way that they can Android (ie HTC Sense) so it looks standard whether you're picking up a Samsung, HTC or Nokia. 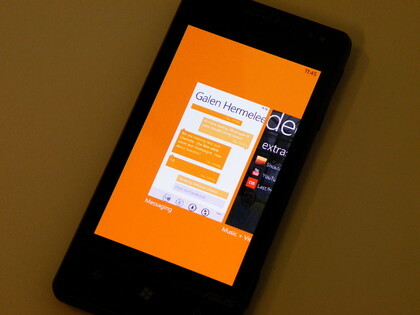 One of the glaring omissions that Windows Phone 7 was missing on launch was multitasking for most apps. It's something Apple was vilified for over the iPhone, yet Android and BlackBerry managed easily. There's a whole argument about what it does to battery life, but something needed to be done and, thankfully, it's been done on Mango. Don't get us wrong, some functions did allow running in the background, third party apps didn't, and these would be closed as soon as you navigated away. 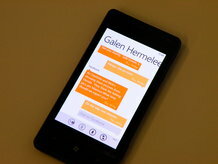 Now, Microsoft has enabled it for apps made by other developers. You long press the back button and it brings up a task switcher not unlike the cards system seen on WebOS. It's pretty and the idea is that it picks up where you left off so that when your switcher screen appears, you see exactly what you were doing in the relevant apps before you switched. We think it works in a similar way to the iOS method of effectively freezing apps in the state they're in when you leave them and resurrecting when you switch back rather than just constantly running. We say "think" because we had a few issues with it, and found it to be flaky at best. For example, we downloaded the official Twitter app (native Twitter support is another matter we'll discuss later) and found a rather strange anomaly. We browsed halfway through our DM feed and then pressed the Windows button to take us back to the main screen. We then held down the back button to bring up task switching and went back to Twitter, which picked up where it left off. However, we found that if we went back into Twitter via the app icon (we'd created a tile on the home screen) rather than the task switcher, it just restarted the app and took us back to the top of the timeline. 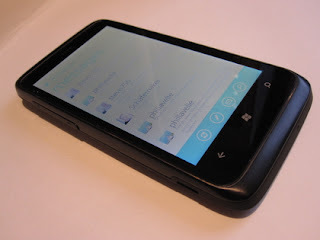 If you're in the middle of composing a tweet or halfway down a massive feed on your Windows Phone 7 Mango phone, this is going to be incredibly annoying if it makes it to the final version. That was as good as it got, unfortunately. We tried it with other apps and it didn't work at all. For example, Sonic the Hedgehog told us it was "resuming" when we tried to go back to it via the task switcher, only to then take us back to the very beginning. We're talking the best part of a minute from the SEGA splash screen to playing, which means that if this isn't sorted out in the final release, gamers are likely to get very grumpy indeed. 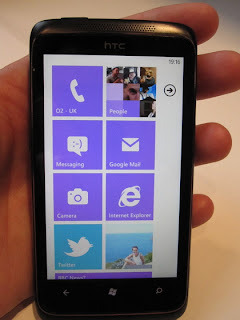 And don't get us started on not being able to set your own tune as a ringtone on Windows Phone 7 Mango. Still. What is this? 2007? Even the original Windows Mobile allowed you to do that!